Nowadays, making video has been more and more popular in our life. As many documentary and short films show, not only the producer but also the audience require a higher quality of filmmaking. We notice that some of the large radial and complicated tracks are too cumbersome to address the needs of shooting. Emerge as the new trend: compact, lightweight and easy to use, stabilizers are brought. Handheld 3-axis stabilizer is a revolutionary product to the film industry. It is so light-weighted and user-friendly to create more possibilities for photographers during filmmaking and at mean time providing smooth videos. However, designs of 3-axis stabilizer cannot address the very crucial part: the bounces caused by photographers’ step while making videos. To solve this problem, the cutting-edge Nebula 4200 5-axis stabilizer has arrived. With two spring arms, Nebula 4200 can absorb any vibrations and bounces under payload acting on the vertical axis and with different spring tension, the two spring arms are also able to filter part of the vibrations on horizontal axis. They are just like the vehicle suspension system which isolates road noise, bumps, and vibrations. Nebula 4200 as the terminator of stabilizer presents you a most smooth experience under the severe environment of recording. And here comes a brilliant accessory for Nebula 4200 to make it the most powerful combination: our new product, Nebula Remote. 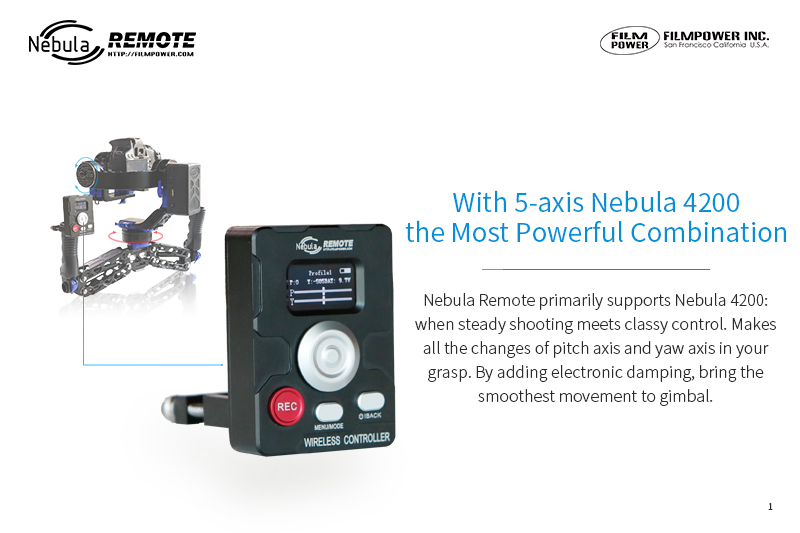 No more complicated operation to control both your gimbal and camera with Nebula Remote. 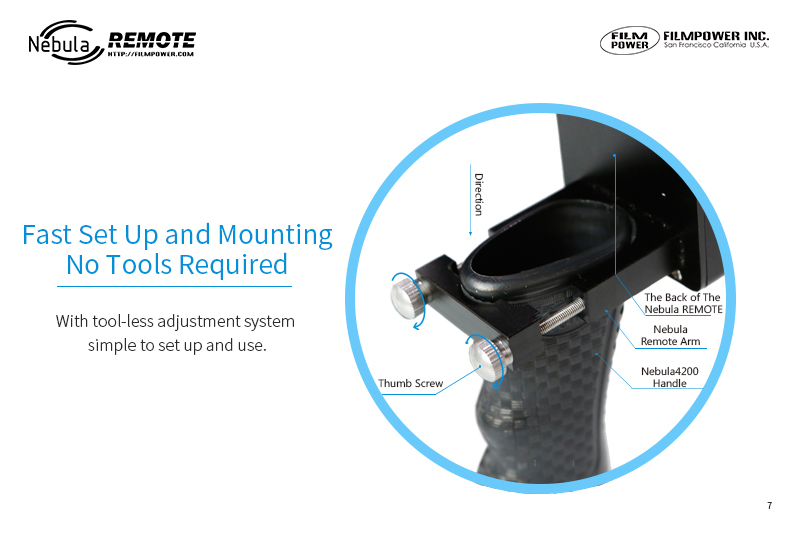 It can be quickly installed on gimbal's handle without tools and can be simply used by thumb to control your gimbal accurately and intuitively. Only one key to stop or continue motor's working, convenient for balancing, fine-tuning and power saving. OLED screen clearly shows the current status, including modes of gimbal, current voltage, battery power, angle of pitch axis and yaw axis and other information. By using the memory function, now it’s free to capture shots that are difficult or impossible. Every design makes filmmaking smoother and easier. 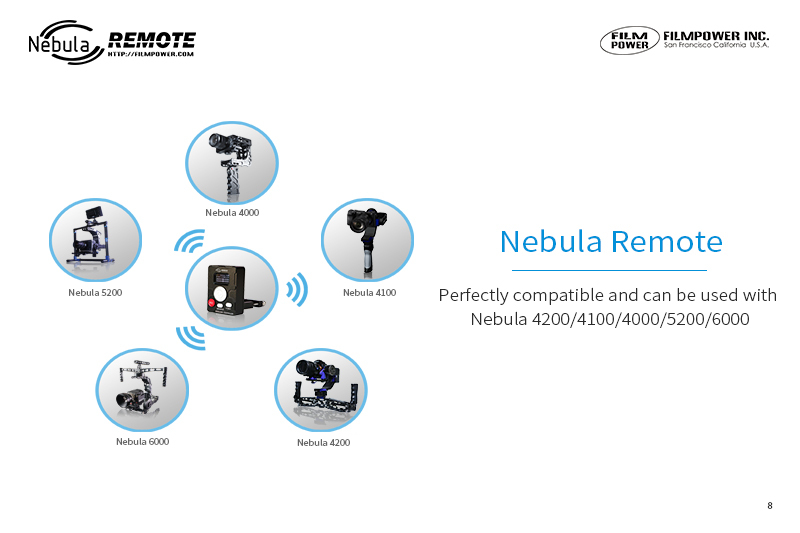 Nebula Remote is compatible with Nebula 4200/4100/4000/5200/6000. The video below is Nebula REMOTE function introduction. The video below is the method of Nebula REMOTE. Hope these can help you to understand the product. 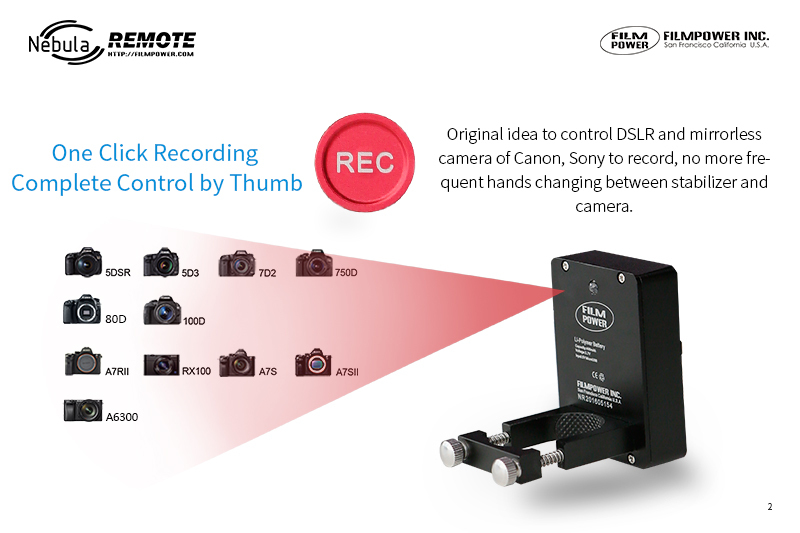 The Nebula remote can control DSLR and mirrorless Canon and Sony cameras to record. Along with control of the gimbal pitch axis and yaw axis. Check out these great views of the remote which will make controlling movement with your Nebula even better. Have a beautiful day everyone and happy filming. Nebula remote can Control DSLR and mirrorless camera of Canon, Sony to record by infrared. Nebula Remote primarily supports Nebula 4200: when steady shooting meets classy control. Makes all the changes of pitch axis and yaw axis in your grasp. By adding electronic damping, bring the smoothest movement to gimbal. 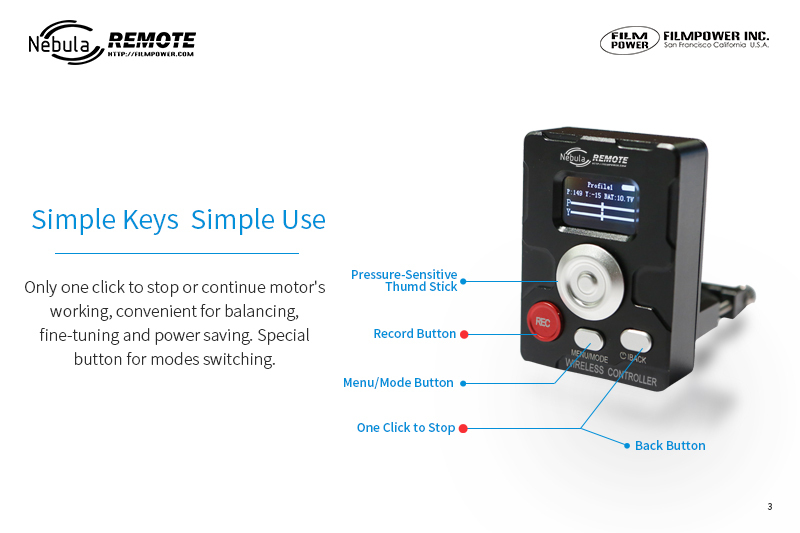 Only one key to stop or continue motor's working, convenient for balancing, fine-tuning and power saving. Special button for modes switching. Under remote mode( gimbal powers on and is connected with Remote), press Back button once to turn off the gimbal, press again to back to work. With tool-less adjustment system to set up Remote, just loosen the thumb screws on the Nebula Remote Arm, insert the Remote onto stabilizer’s handle, adjust it to your desired place and fasten the thumb screws. Setup complete. 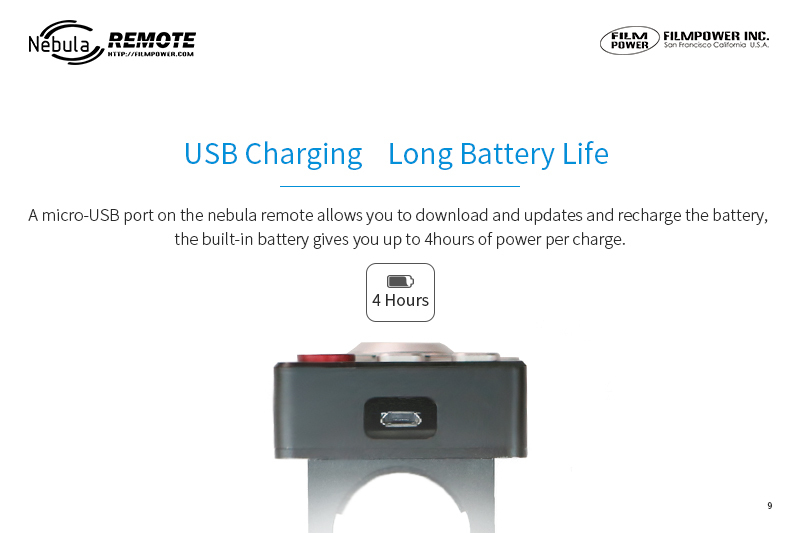 Nebula Remote is built-in standard Micro USB port for charging and upgrade. Please charge it with original charger and data line, an hour charging for 4 hours using. When you own a Nebula 4200 you'll have lots of fun playing with it on a day off......or on! Check out this really fun video of the Filmpower Nebula 4200 5-Axis Stabilizer. guys! I need help. my remote froze. it says "connection..." I can't turn it off! Well, can wait as batteries discharge. the problem changed. I don't know for how long I held the power on/off button but it finally turned off now it takes forever to turn on again and all camera operations and menu selections have a huge delay, it makes operating the gimbal with the remote impossible, also I cannot change the profile, the REC button does not work (I can't tell if it worked before because I just recently set my Sony camera to remote control) and...it takes 20 seconds to turn off. Let me know as it will start ticking and show countdown time :-) Just type fast, ok? no reply from support yet, today was the first day of a big video shoot and the Nebula was almost useless for my use without the remote, damn. Send me via PM detailed problem description. And I make sure that you get reply. The Nebula remote that ships is different than the one shown in all of the photos, directions and support videos. The bracket is shown mounted to the back of the remote, but, it comes attached to the bottom. This makes it very difficult to attach to the chunky handles on the 4200 gimbal. It does not fit the 4000 at all. If it was assembled like everything from Filmpower, it would be fine. Any idea why this was changed from the original assembly? It literally just barely fits the handle on the 4200 and only in one position. You can't move it up or down the handle AT ALL. Even the picture on the box is different than what you get. Bad idea. Not as useful as I had thought it would be. Just wanted folks to know this problem exists. Can you make few photos?